There is no easy way to collect prompted awareness in an Internet interview. Neither is there an obvious means to probe an openended question. Internet interviewing suffers as much as other self-completion methods do with no interviewer to act as moderator. Survey Guardian, a new technology product from Utah-based online interviewing specialists HumanVoice, could be about to turn these assumptions on their head. Survey Guardian occupies a slim panel on the left hand side of a web interview, allowing respondents to interact with live interviewers using "chat"-style messages. After a few messages of introduction and welcome, the interviewer retreats to fulfil a watching brief. If the respondent seems to be having a problem, the interviewer can post an enquiry or message of encouragement. Alerts can be programmed in so that interviewers take control at certain key points. This way, an interviewer can probe openended questions, or administer traditional questions that differentiate between unaided and aided awareness. The respondent sees a picture of the interviewer and an easy-to-follow scrolling box containing the colour-coded chat dialogue. There is also a 'call me' button which will summon a CATI interviewer to place a phone call to the respondent, so that the interview can continue in CATI. 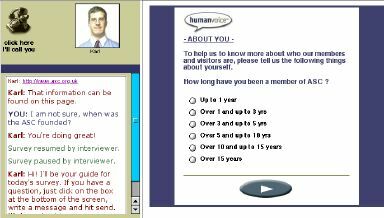 Because the interviewer is not involved with every second of the web interview, HumanVoice has found that they can follow the progress of up to three interviews simultaneously, set out in three parallel columns that mirror the respondent's view. A zoom tool gives a view of the main questionnaire part of the respondent's screen too. Another important tool is the 'Knowledge Base', a customisable library of standard responses and fragments that interviewers can drag and drop to the message panel. This aids consistency and saves enormous amounts of typing. Interviewers can also direct the respondent to other web pages, opening up the tool's capabilities for qualitative or quantitative website evaluation. 100 companies, is an early adopter of Survey Guardian. He commented, 'We have had excellent success with Survey Guardian. It has enabled us to address major concerns regarding sample size and response rates. By and large, respondents seem to be embracing it well. B2b CATI is becoming increasingly difficult: people are very busy and much more mobile. Respondents have been telling us 'please make this electronically available it makes it much easier for me to interact.' Many prefer to complete the interview at home or at a time to suit them better, and this is reflected in much improved responses rates. 'The main thing to establish a good rapport with the online respondent. We try to write our own customized responses to match the audience. If you are interviewing high-level decision makers the responses need to reflect a higher level of education or it sounds insulting.' The problems Bill Stone sees are not with the technology but with the industry's attitudes to it, both in acknowledging the problems Survey Guardian overcomes and establishing client confidence in this as a methodology. Survey Guardian is not a CATI or web interviewing system as such. It has been designed to wrap around virtually any web interviewing tool, and will work best with those that integrate CATI with web interviewing capabilities. Some software tweaks are needed to the host CATI/web package in order to get the two to interact properly. HumanVoice is currently at an advanced stage of negotiation with several major vendors. SurveyGuardian is offered on an ASP basis via HumanVoice's chat server and adds a cost of around $1 US to every completed interview. Total running costs for this hybrid method, including paying for interviewers, seem to fall midway between CATI and unassisted web interviews. In the short term, its success will depend on the willingness of CATI manufacturers to integrate with it. As HumanVoice is offering implementers a share of its ASP revenues, you may soon be hearing from other sources than this what a good idea Survey Guardian is. Published in Research, the magazine of the Market Research Society, March 2001, Issue 418.